There are few things as unpleasant in life as getting a headphone cable snagged on a doorknob. Or the corner of a table. Or the watch of a total stranger passing me on the sidewalk. Because the cable runs the length of my body, from the earbuds on my head to the phone in my pants pocket, it’s way too easy for it to get caught on just about anything, and it’s a truly jarring experience every time it happens. Which iPhone podcast app is best for you? 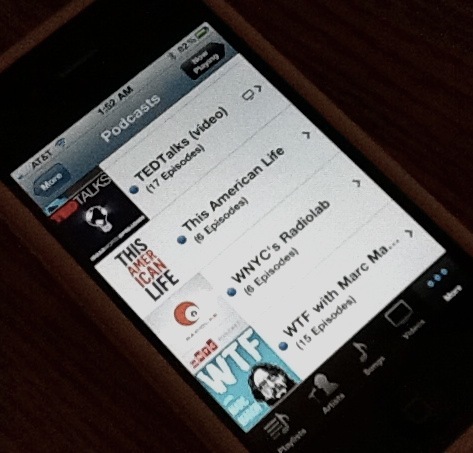 Pocket Casts vs. Downcasts: Which is the superior podcast app? 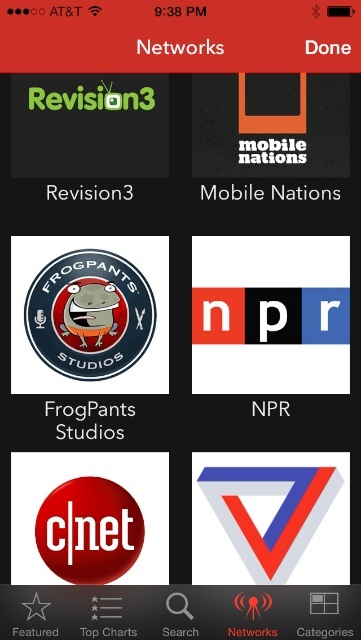 I’ve been using Pocket Casts as my main podcast-listening app since the beginning of the year. (You can read my original review here.) The main advantage Pocket Casts has over Apple’s own podcast app? 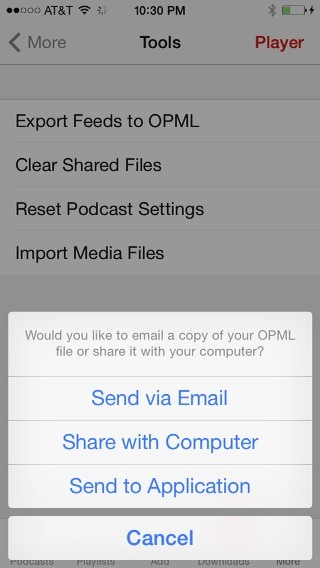 Greater ability to organize podcasts. 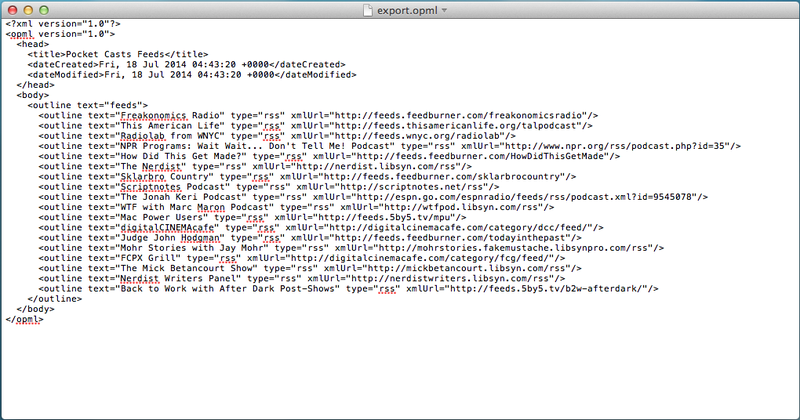 For example, I like having a listview of only podcast episodes that have been both downloaded (i.e. not-to-be-streamed) and are unplayed. Pocket Cast can do that. Apple’s podcasting app can’t. Pocket Casts does have one annoying quirk, though. 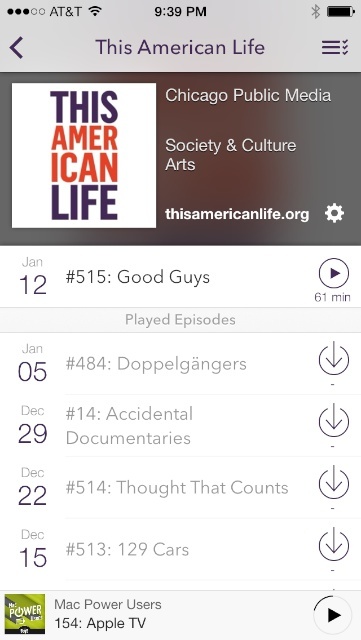 The app’s filters are a great way to view your preferred podcasts, but they lack “continuous play” (i.e. when one podcast ends, the next one on the list automatically begins). To get that, you have to manually add episodes to a separate playlist. It would be better if filters and playlists were the same thing. This might not seem like a big deal, but I hate it when I’m driving and the podcast I’m listening to ends, only to be followed by dead silence. The last thing I want to do while behind the wheel of a car is mess with my iPhone. It might not happen often since the average podcast is about an hour long, but it happens enough that I figured it’s time to give another app a chance. That app: Downcast. Let’s take a look at how it compares to Pocket Casts. 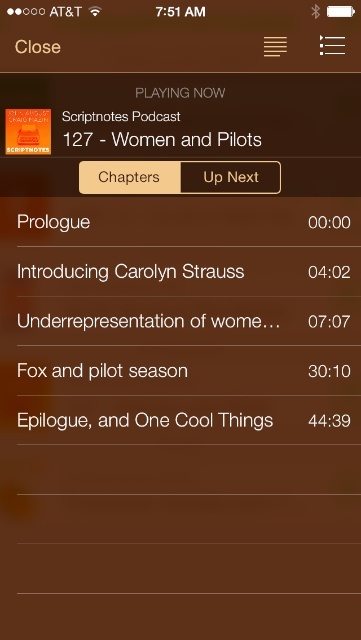 Like Pocket Casts, Downcast has a little red icon with two curved lines. 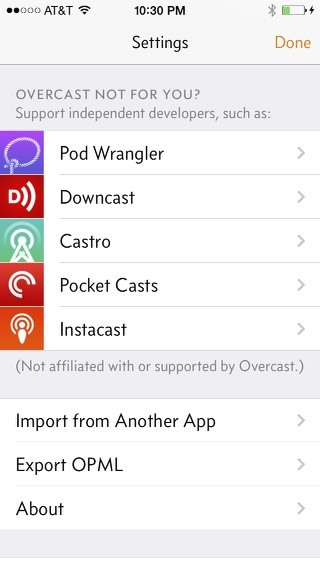 Like Pocket Casts, Downcast currently costs $2.99. Like Pocket Casts, Downcast is extremely customizable when it comes to automatically filtering out (or in) podcast episodes. Unlike Pocket Casts? Downcast does its filtering right in playlists. 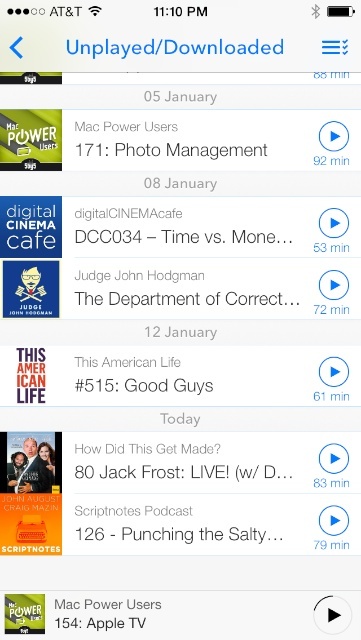 Downcast must be my new default podcast player, right? Not so fast. Let’s look at them side-by-side. Long-time readers of this blog (hi, mom!) know my affinity for podcasts. I’ve offered advice to aspiring podcasters. I even returned my first Android phone largely because I didn’t like how that platform handled podcasts (in 2010). So when Apple came out with their own dedicated Podcast app over a year ago, I was ecstatic. Though version 1.0 was full of bugs, it offered one feature that made it worthwhile: A single playlist that automatically showed all my downloaded & unplayed podcasts, ordered from oldest to newest. That’s all I really needed. And then Apple updated their Podcast app. The bugs largely went away… but so did the one function I actually used. The new “unplayed” list now showed all the unplayed episodes of all the podcasts I subscribed to, whether they had been downloaded or not. Here’s the thing: If I haven’t downloaded a podcast episode, that means I don’t want to listen to it. (I have zero interest in streaming podcasts while I’m out and about.) I kept waiting for a revision that would restore the ability to automatically hide undownloaded episodes, but, alas, that day would never come. Above is the app’s home screen, where you’ll find a bevy of filters and lists you can customize to organize your library. 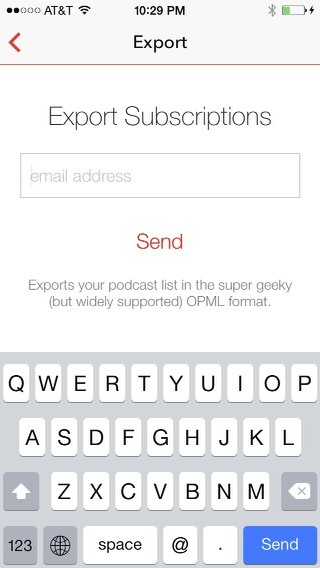 This is what the app looks like after you’ve subscribed to some podcasts. Subscribing to podcasts is very easy. 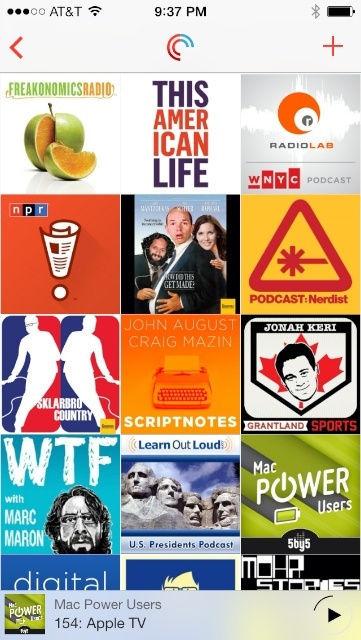 As soon as you hit the “+” in the upper right hand corner (from almost any page), you’re greeted with a page of Featured Podcasts. 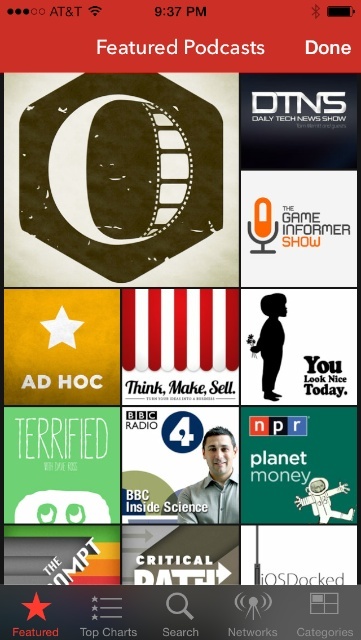 You can also see podcasts grouped by popularity, categories, and network. Once you’ve subscribed to a podcast, you can see all available episodes. You can then download only the ones you want to listen to. You can also set it to auto-download new episodes in the future, if you wish. Thanks to iOS 7, downloading is done in the background, and only on wifi if you don’t have an unlimited data plan. From the episode page, you can choose to start playing the episode immediately or add it to a playlist. 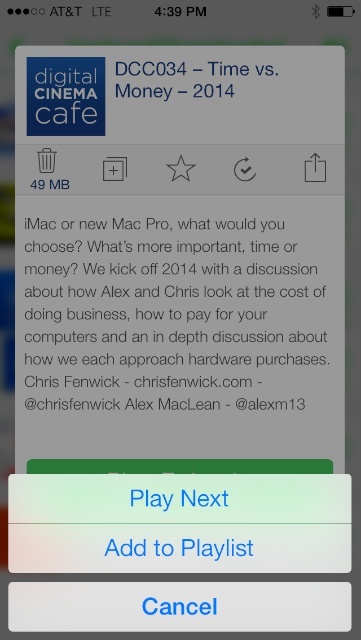 There’s also a “PLAY NEXT” option I’ll go into detail more later. Viola. A list of just the episodes that are both unplayed and downloaded. The app is not without its quirks. For example, you can create a “filter” — like the one seen above — that will automatically sort your podcast library by whatever criteria you want, but it’s not the same as a playlist. 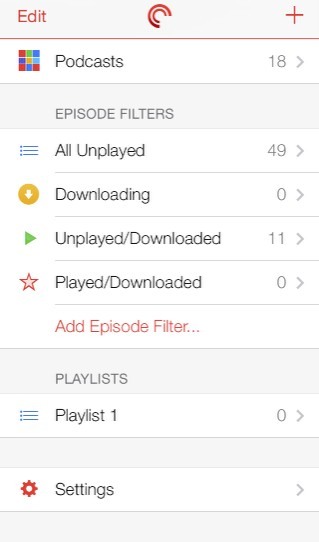 Selecting an episode in the “filter” list will only play that individual episode. It will not automatically go onto the next one in the filter. You need to create a “playlist” to do that. Adding episodes to a playlist is easy, but, still, it’d make more sense to just have filters and playlists be the same thing. The reason I left the Apple Podcast app is because I didn’t want to have to manually add anything to a playlist, yet here I am, having to do just that. 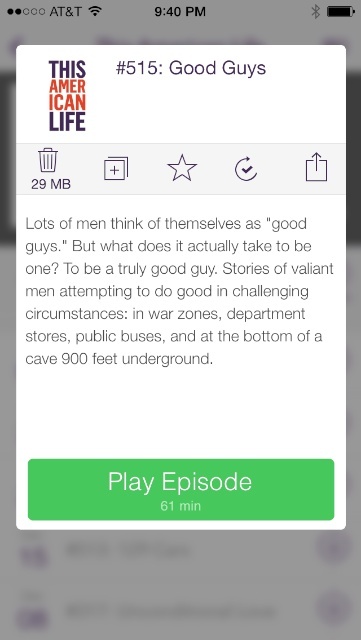 But just when I was ready to give another podcast app a try (for another $3), Pocket Cast won me over. The saving grace? The “play next” button. One of the reasons I hate playlists is this: Let’s say you see an episode you’d like to listen to after the current podcast you’re listening to is over. So you add it to a playlist, where it appears at the bottom of the list, and then you have to manually move the episode up, in order to hear it next. With the “play next” button, it’ll cut through all that. Just hit that button and the app will automatically cue the selected podcast to start playing as soon as the current one is finished. 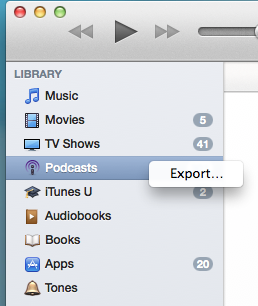 It’s a feature I never knew I wanted… and now it’s the main way I listen to podcasts. 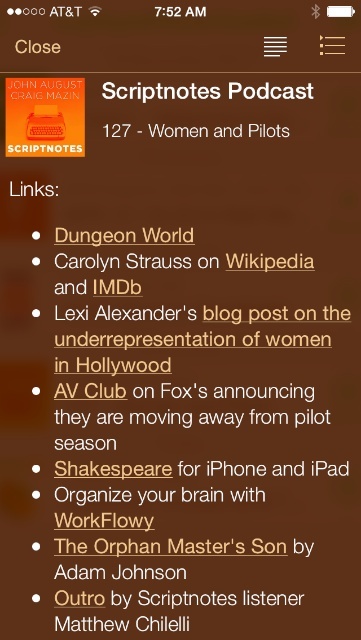 Only one podcast I listen to — Scriptnotes — uses chapter markers, but I imagine more and more podcasts will start to. Another thing it handles quite well: Links to additional content. The app might not be quite what I expected (seriously, filters and playlists shouldn’t be two different things), but I’m not regretting the purchase. 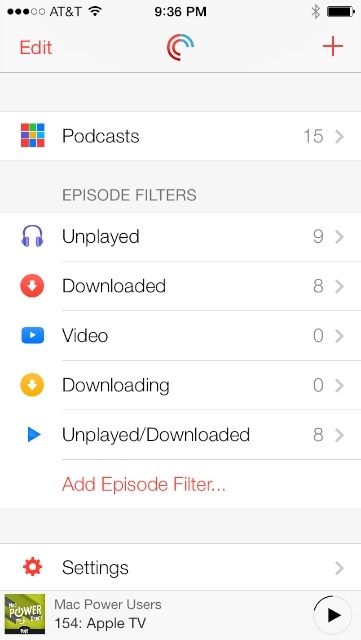 If the idea of super-customizable filters, a “play next” option, and an extremely user-friendly interface for finding & subscribing to new podcasts intrigues you, then I can easily recommend Pocket Casts. First off, if that’s what you’re saying… you’re a liar. Every podcast of yours that isn’t getting downloaded will send you into a tizzy. If you don’t believe me… well, just ask anyone who’s been podcasting for a while. First up, I didn’t do it because of the iPhone 4. Doubt me if you will (and I know you will), but it’s true. I also didn’t return it because of the screen. Sure it might not have the highest resolution available, but it’s still pretty darn impressive. In fact, the screen size was the one thing I might’ve kept the phone for, despite my other gripes. I didn’t do it because of Android. Well, not explicitly because of Android. I don’t mind Android. I love the widgets, I love the way I could customize the home screen. I really liked many of things Andoid does that aren’t even options on the iPhone. 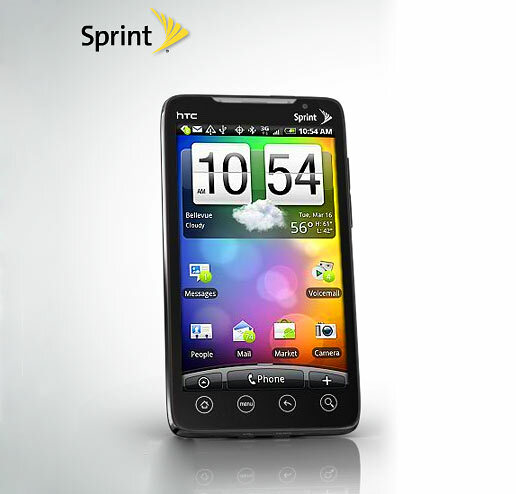 I even liked HTC’s custom “Sense” interface. I didn’t do it because of the battery. Sure, the battery life of the brand new Evo was only marginally better than my two year old iPhone 3G, but it was a lifespan I could deal with, and if it got worse, buying a new battery would be easy and painless. And I didn’t do it because of the lack of 4G. Guess what? Despite the fact that Los Angeles isn’t yet an officially supported 4G city, I found plenty of places around town with 4G service, including my own neighborhood. That was actually one of the biggest, more pleasant surprises about the phone. No, I did it because of one word: Podcasts. Yes, you read that right. Podcasts.